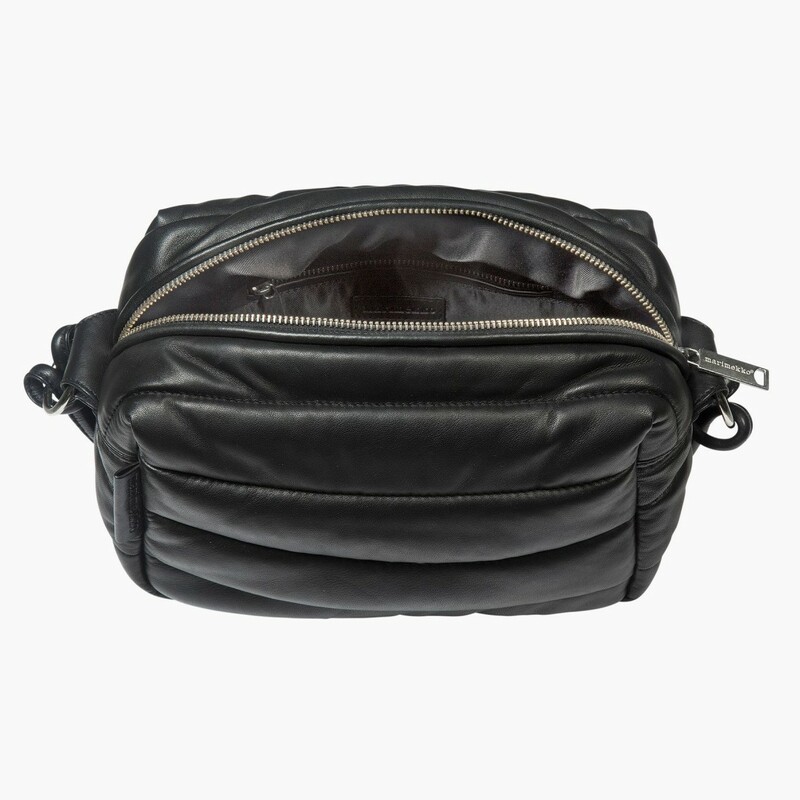 The Aava padded handbag is made of fine black leather and it is a versatile accessory, which can be either used as a regular handbag or as a fanny pack around the waist. The bag has a zipper closure, an inside lining, an adjustable shoulder strap and two zip pockets, one on the inside and on the back on the outside. 100% leather + lining 100% polyester + padding 100% polyester. H16 x W35 x D13 cm. The Alisa shoulder bag is made of printed leather and decorated with the black and white Kukko ja Kana pattern. It has a zipper closure, a long shoulder strap and a zipper pocket on the inside. H11 x W20 x D6cm. 100% leather, lining 100% polyester. The quilted Pixie handbag is made of dark green or black leather and it has a two-part shoulder strap, a zipper closure and two pockets on the inside, one of which closes with a zipper. 100% leather + lining 100% polyester + padding 100% polyester. H16 x W24 x D13.5 cm. The quilted Ellis backpack is made of leather and it has thin adjustable shoulder straps and a zipper closure. It has two pockets on the inside, one of which closes with a zipper and a zipper pocket on the back panel for safekeeping of small items. 100% leather + lining 100% polyester + padding 100% polyester. H30 x W18 x D7 cm.